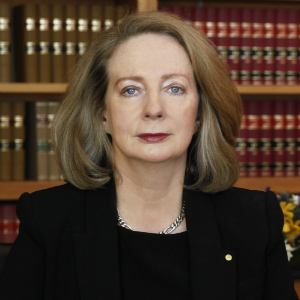 Eminent jurist Susan Kiefel AC has been announced as the 13th Chief Justice of the High Court of Australia. Susan Kiefel AC (pictured) will be appointed in place of CJ Robert French AC, following his retirement in January next year. Born in Cairns in the 1950s, the young Susan Kiefel scorned the idea of pursuing a career in either nursing or teaching, as many capable young women of that era were encouraged to do. Instead, she chose to forge her own path and left high school at the age of 15 with dreams of financial independence. In a chapter dedicated to the professional trajectory of the Chief Justice-designate, the book A woman’s place: 100 years of Queensland women lawyers describes the period of time, fresh out of school and in her teens, when she undertook work as a secretary for a group of Queensland barristers. That self-determination and disciplined focus was precisely what blazed the way for a young Queensland woman without an undergraduate degree to rise through the ranks of the profession. By the age of 33 she had taken silk, the first female barrister to do so in Queensland, and was on her way to undertaking a master's degree in law at Cambridge. The barrister went on to carve out an enviable reputation at the bar, in commercial law and equity in particular. In a statement issued yesterday, Justice Kiefel said she was “deeply honoured” by the news of her appointment and would work to uphold the independence of the court and its importance as an institution. This is the first time in Australia’s history that a woman has been appointed to head the highest court in the nation. Amid what has been widely described as a historic, landmark appointment, Professor Rosalind Croucher AM, the president of the Australian Law Reform Commission, said the Chief Justice-designate would not want too strong a point to be made of her gender. The two worked together at the ALRC, before Justice Kiefel’s appointment to the High Court of Australia in 2007. Justice Kiefel had worked as a part-time commissioner of the ALRC since 2003. “Susan Kiefel is all about a personal understanding of yourself, what you truly want to do and then setting about a path, honestly and ethically, to achieve that. Her whole CV reads as an application of that mantra,” Professor Croucher said. “She recognised that it is not about barriers [as a woman in law], it’s about opportunities and how you make your own path within the goals that you set,” she said. The Law Council of Australia (LCA) welcomed the announcement that the Governor-General had accepted government advice regarding Chief Justice French’s replacement next year. “Justice Kiefel’s talent and commitment to her profession have taken her to Australia’s highest judicial office,” LCA President Stuart Clark AM said. Mr Clark also commended the “exemplary” leadership and devotion shown by CJ French during his eight years leading Australia’s highest court. “He leaves a legacy of important contributions to the law, notably in his commitment to Indigenous justice,” Mr Clark said. LCA president-elect Fiona McLeod SC said Justice Kiefel has set a wonderful example for other practitioners throughout her career and has “smashed the glass ceiling in law”. “From her own remarkable journey as Queensland's first QC and her service on the Federal Court, Queensland Supreme Court and the High Court, Justice Kiefel has served the Australian community with distinction. “Her appointment will encourage women lawyers everywhere to aspire to the highest office. I look forward to her continuing contribution to Australian jurisprudence,” Ms McLeod said. Echoing the words of Prime Minister Malcolm Turnbull, Australian Women Lawyers described the judge as “an inspiration”. “Having once described herself as a lonely tree amongst a forest of men during her early years at the bar, Her Honour recognised that women are now part of the landscape. AWL is pleased to note, that landscape now extends to the highest judicial office in the land,” AWL said. In 2011 Justice Kiefel was named a Companion of the Order of Australia for eminent service to the law and to the judiciary, to law reform and to legal education in the areas of ethics, justice and governance. The day after Justice Kiefel steps into her appointment next year, Federal Court judge James Edelman will be appointed to the bench of the High Court. Justice Edelman hails from Western Australia, the home state of Chief Justice French. Aged 42, Justice Edleman is one of the youngest appointments to the High Court.